Many non collectors who came to my blog have a wrong idea and twisted information about 50 sen 1967, 1968 & 1969. Many of them thought that they can sell their coins for RM10,253 a piece. I already wrote my explanation in Malaysiancoin.com, why that 1969 50 sen Milled Edge can be sold for RM10,253. "The Latest Auction in Singapore, 50 sen 1969 Milled Edge sold RM81,846"
Some readers who most probably only read the title of the post and straightway jump to their own conclusion, any 50 sen 1967, 1968 & 1969 can sell for a higher price like that coin. How much my coin worth? How can I sell my coins? Can you sell my coins for me? Informing me that they have 50 sen 1967, 1968 & 1969 and asking me if I want to buy. I think many dealers and well known coin collectors also having the same problem as me. Before we talk any further about these, I want to share with non collectors, Information about 50 sen 1967, 1968 & 1969. As you can see, they're millions pieces of 50 sen 1967, 1968 & 1969, the coins are not that rare compare to 10 sen 1971 with only 32,236 pieces minted by Bank Negara Malaysia. Everyone in Malaysia can get a piece of the 50 sen 1967, 1968 & 1969 security Edge (50 sen berparit, berlongkang, belah tepi, belah tengah, sisi sekuriti). In laymen term, the coins are not that rare and most people have that coins in their collection. Officially, the 50 cent 1967, 1968 & 1969 are released in security edge but they're some coins mistakenly entering the coin circulation with a milled edge. These coins are little bit hard to find and it is almost impossible today to get them from circulation coin that you received from grocery, mamak or nasi lemak makcik. If your 50 sen 1967, 1968 & 1969 is not with a security Edge (50 sen berparit, berlongkang, belah tepi, belah tengah, sisi sekuriti), that mean it is a Milled edge coin. They're only few pieces of Milled edge coins around and they're also fake Milled edge coins made by using real 50 sen. Most of non collectors will only have the security edge coins. Grading is about the condition of the coin itself, one of the key factors in determining its value. Coin grading can be a difficult subject for the non-collector. Very Fine (VF), Extremely Fine (EF) and Uncirculated (UNC) are some of the terms used by coin collectors to determine the coin grade. A cleaned coins cannot get a Uncirculated (UNC) or Brilliant Uncirculated (BU) grade, a mistake that most non collectors don't understand. They're also third party grading company that provide grading service to coins with a fee. Numismatic Guaranty Corporation (NGC) and Professional Coin Grading Service (PCGS) are some of the company that are providing Third Party Grading Service. If you look at NGC coin database, they're only a few of Malaysia coins get a higher grade MS66 and above. 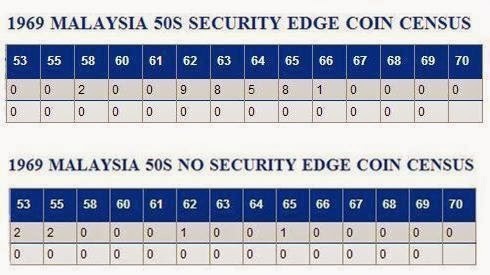 You can look at the database from NGC Malaysia coin census for 50 sen 1969 security edge and 50 sen 1969 Milled edge (no security edge) below. 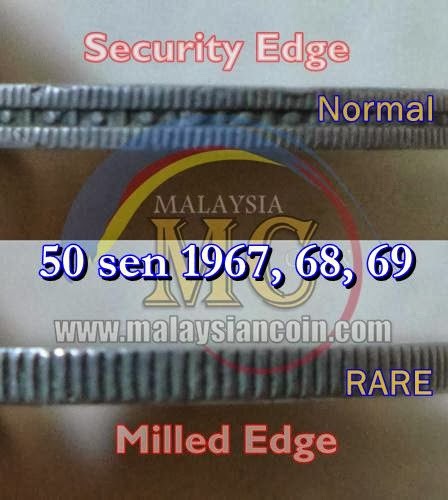 From a total of 33 pieces of coins graded for 50 sen 1969 security edge, only 1 piece of coin make it to the MS66 grade and not a single coin from 6 pieces graded so far for 50 sen 1969 milled edge (no security edge) get into the MS66 grade. The best grade for the milled edge is only MS65. The coin that make it to the Malaysia coin record for the most expensive Malaysia circulation coin sold in auction so far is only have a grade of Au-55. Since most non collectors only have a coins with a Very Fine (VF), I am only sharing a VF coin price. This Market price list is just a guide for you. Not a must follow buy and sell agreement. Where you can sell your coins? If you want to get the market price for your coins, the best and the only way is by selling them yourself. You cannot get a market price by selling them to coin shop, coin dealer or even selling them to me. If you want to sell a 50 sen security edge to any coin shop and coin dealer, they most probably don't want to buy because they have plenty of stock available with them. You will only get around 30% to 70% of the coin value if you want to sell them to coin shops and coin dealers. I already shared my tips about how to sell your coins in my blog; Panduan mudah menjual duit lama. How can you get a high price for your coins? First of all you need to be lucky since it is hard to get a coin that get a high grade like that and you can only hope people will buy your coins with a very high price. Secondly, your coins must have a very high grade. Third party grading is an advantage, it might cost you more but it will give you benefit later. Thirdly, If you want to send your coins for auction. You need to make sure that your coins are in the right auction house. Since we are talking about Malaysia coins, you need to find any auction house that are popular among Malaysia coin collector.